ZenPop Japanese Stationery Pack is a subscription box brought to you by ZenMarket filled with unique Japanese stationery and studying goods handpicked by their staff in Japan. The Cost: $29.50 a month with free international shipping. Save with longer commitments. The Products: 12 or more cute and useful stationery items like pens, notebooks, stickers, and more. Good to know: Starting in January 2019, ZenPop will become a subscription only service so they will discontinue the inclusion of subscription-only bonus items. Past boxes are sometimes still available via their marketplace. This time of year is my favorite for setting up my planner for the year ahead. These cute and very tiny stickers are going to be a fun addition. The size is great, they can easily fit into a day block in my calendar and still leave me plenty of room for notes. There are two options and I received the “Chubby Animals” set which includes half of the sheet for annual events and the other half for daily events. There are two miniscule eggplant stickers that I’ll have to be judicious when choosing the perfect occasion to use them. Who knew there was a sophisticated adult version of the coveted scented markers of elementary school days? I’m completely smitten. This brush pen, with two differently sized nibs at each end, has had sandalwood mixed in with the ink. You can smell it the moment the pen is uncapped and since I love that particular aroma, I’m sure I’ll be using this a ton. The barrel of the pen has a cute red and white daruma doll design, which are associated with good luck. This is a matchbook-sized notepad and the name corresponds to sounds in the Japanese syllabary. I found similar Mamimu memo pads here. The binding on the edge makes it look like a tiny book and makes me hesitant to pull pages out because it’s adorable in its unused state. If you are going to use it for memos, they’ll have to be exceptionally brief. This is a small bonus item sent to everyone that you can attach to your keys or potentially a phone. Perfect if you need to take notes on the go but too small for much everyday use. I received the Cinnamoroll version with a blue jewel on top. I’m always partial to mechanical pencils myself but I think this is something my niece will really like to add to her pencil case. Since the pencil arrived unsharpened, it’s lucky they included a sharpener as well. The blue penguin design matches the pencil and has an easy flip top for emptying your shavings. This roll of washi tape is decorated with images of “The Seven Deities of Good Fortune.” They are believed to grant good fortune and the number seven is also considered lucky. This tape will be put to use on New Year’s note cards and maybe bring some good luck to the recipients. 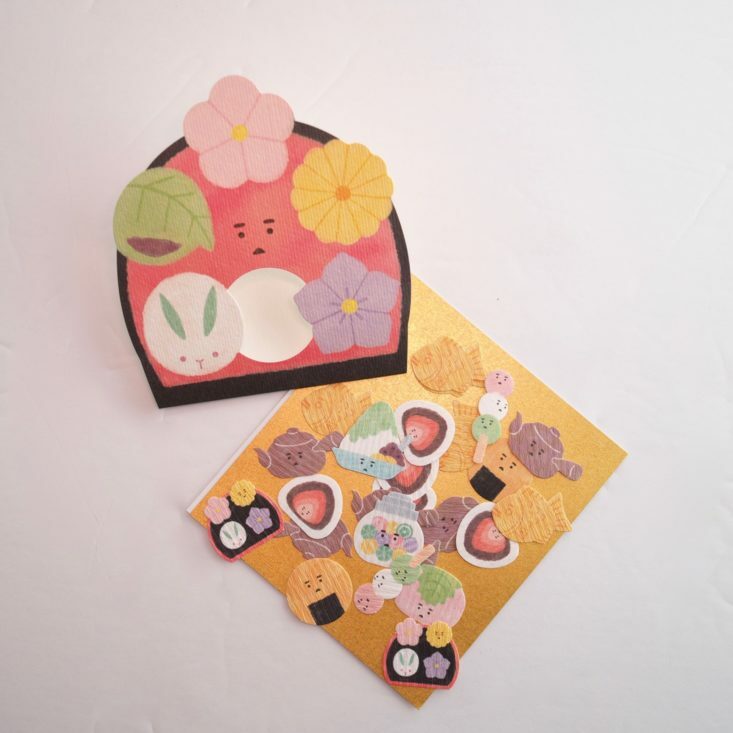 These sticky notes have a variety of Japanese sweets around the border, which are seasonal foods like the white rabbit shaped sweet-bun for winter. I love them as a colorful alternative to a standard yellow Post-It. I’ve never seen stickers made out of washi paper before! It gives them an interesting rippled texture that stands out. I love the color palette they’ve used for these small sweets with their tiny morose faces. Matcha or green tea is often served with traditional sweets or wagashi. Of the options, I received the eraser which looks like a small cup of matcha complete with a saucer and a mug with flecks of blue in the white. It would be great for a doll’s tea party but I can’t imagine using it much to do any actual erasing. As of January 2019, ZenPop is switching to a subscription-only model so this is the final bonus item month. They included a collection of small stickers all of the Japanese breakfast food – fish, rice, soy sauce, etc. Compared to the two other sticker packs in this box this one lacks the charm of the chubby animals and the unusual texture of the washi stickers. Can you still get this box if you sign up today? No, new subscribers can still receive the January box and may be able to find past boxes via their marketplace. Value Breakdown: This box costs $29.50 + free shipping, which means that each of the 12 items in the box has an average cost of $2.46. Check out all of our ZenPop Stationery Pack reviews and more stationery reviews in the Paper and Stationery Subscription Box Directory! What do you think of ZenPop Stationery Pack? Regina is a pen and lipstick collecting fool! She discovered subscription boxes when they came to the rescue in building up a work wardrobe and now loves to try new snacks and skincare samples. So what is the countdown for? I like the idea of ordering the box that I like. I don’t care for January’s so do I wait til February to order? Please help if anyone can help – I’d really appreciate it. Sorry for going on so long!! BTW not happy their discontinuing bonus gift. I’ve found “aromatherapy” scented felt-tip pens at Dollar Tree, of all places! I got them for my coworkers as sort of a gag gift.